Are you one of the many people who would love to own a Reliant Robin, but feel that it has too many brakes, it looks too conventional, the engine’s both in the wrong place and has, like, twice as many strokes as it should, and you’d never want to own a car with a symmetrical arrangement of doors? If that’s you then I’m delighted to say I’ve found the car for you: a SAIL Badal. Wait, you never heard of the SAIL Badal, or even SAIL as a company? I’ll pause while you find a mirror to stare into and then punch, in shame and rage. All good? Okay, let’s get you some of the sweet illumination of knowledge here. SAIL stands for Sunrise Automotive Industries Ltd and was founded in 1974 in Bangalore, India. Like many companies looking to set up an automobile factory from scratch as easily as possible, they looked to Britain’s Reliant Motors, makers of the fiberglass-bodied 3-wheeled Robin and the sporty shooting brake, the Scimitar. Reliant had a sort-of side business helping to set up carmakers in countries less known for their car-building prowess. Reliant helped Anadol get started in Turkey and Autocars in Israel, for example. Reliant’s models were a good place to start, as the fiberglass bodies eliminated the need for costly and complex body stamping machines. While SAIL (in 1978 the name was changed to Sipani, just FYI) looked to Reliant to get started, the car they designed diverged pretty dramatically from the basic Robin. While the chassis was clearly Robin-derived, a three-wheeler with the single wheel in the front (not the most stable way to do this), SAIL sourced a 198cc Innocenti two-stroke engine from Italy. Just to keep things even more exciting, they mounted that little 12 horsepower, one-piston’d brute in the rear. Oh, and you better take it easy on the gas, because you’ve only got brakes on the rear wheels to stop those dozen angry horses. The body design, though, I think is the biggest innovation of the Badal. Perhaps they looked at other one-box, rear-engine designs like the Fiat 600 Multipla or even the Volkswagen Microbus, because the design is sort of reminiscent of those. It’s not quite a one-box design, as there is a little stumpy hood, but all that’s in there are driver legs and the pivoting front wheel. The body forms a sort of tall wagon/van design, with two doors on the passenger’s side and one door on the driver’s. I think it’s actually a very clever and space-efficient design, though it does suffer from the big flaw of not having exterior access to the rear luggage area over the engine. They should have had that rear window open like a hatch. The styling isn’t totally utilitarian, with lots of creases and character lines and moldings all over the car. Even though the car was built between 1975 and 1982, the styling seems more late-’60s inspired, and details like the side air intakes for the engine remind me of a lot of experimental rear-engine concept cars from Eastern Europe in that era. I consider that a compliment, but I’m not sure if many others agree. From what I can tell, the Badal didn’t sell all that well, and it appears it’s considered an outright failure by some observers of the Indian automotive market. It’s pretty fun to watch that little plastic shitbox bounce around and drive through tubes, too. It’s also possible that SAIL’s crack marketing team was the first to use the term ‘smileage’ in place of ‘mileage,’ which has to be some kind of automotive advertising landmark. That one is in the Heritage Transport Museum, Guragon, India, and that’s a blow-up of the brochure behind it. The Badal is just about unknown here in America, and I think that’s a shame. 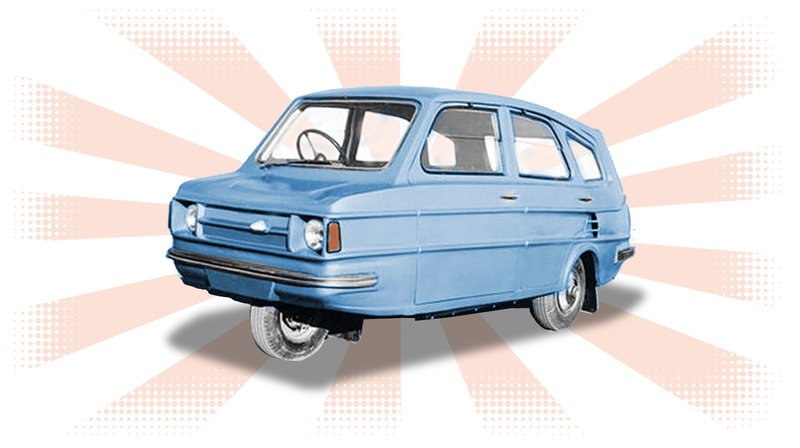 This was a clever, well-designed little microcar that helped bring cheap transportation to people, and it should get recognition like Isettas and Reliant Robins and other microcars do. So let’s hear it for the SAIL Badal!